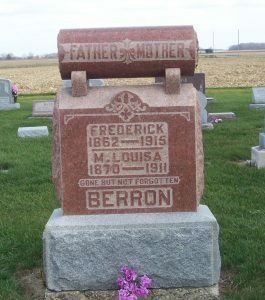 Frederick Berron was in born Petersbach, Saxony, on 24 October 1862, the son of Georg and Katharina (Housenmicht) Berron. His family immigrated sometime after 1868 and it appears they lived in Adams County, Indiana, just across the state line from Chatt. They attended Zion Chatt the late 1800s. 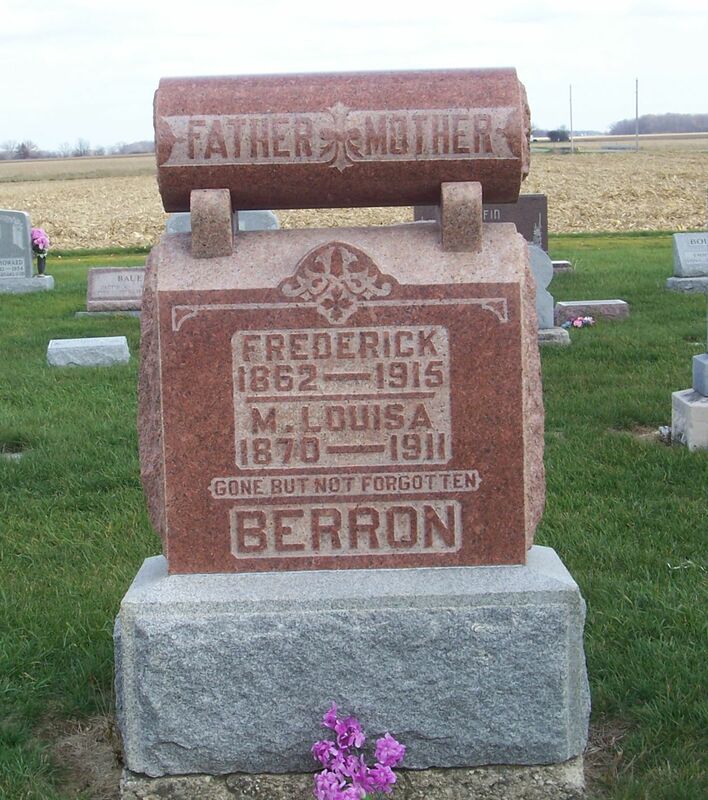 Frederick Berron married Louisa Bollenbacher on 26 November 1889 in Zion Chatt’s rectory. Witnesses to their marriage were Jacob Kühm and Julia Kühm. They were married by Rev. Christian Reichert. Louisa Bollenbacher was the daughter Jacob Bollenbacher and his second wife Caroline Schaadt. Louisa was born in Liberty Township, Mercer County, Ohio, on 27 March 1870. In 1910 Frederick lived with two of his children in Jefferson Township, but wife Louisa was absent and Frederick was enumerated as widowed. In the household in 1910: Fred, 47; Carrie, 14; and Fredie, 10. This enumeration was taken 28 April 1910 and Louisa was still living. Perhaps she was ill and living elsewhere? Frederick was a farmer and owned his farm. He could read and write. Frederick lived near the John Caffee family and one of the Caffee Children, Howard, 18 years of age in 1910, eventually married Caroline Miller, my grandfather’s sister. Hulda, Jacob, and Frieda were baptized at Zion Chatt. Otto, Emma, and Frieda were confirmed at Zion Chatt. These records give birth dates and name their father as Frederick Berron. Emma, Hulda, Katie, and Frieda were enumerated in the 1900 census as their children. Zion Chatt’s records agree with most of that information except their records indicate he was 52 years, 10 months, and 9 days old and was buried on the 5th. The church record states that he died cancer and tuberculosis and was survived by his children, brothers and sister. 1900 U.S. Census, Jefferson, Adams, Indiana, ED 4, p.12A, dwelling/family 209, Frederick Berron; digital image by subscription, Ancestry.com (www.ancestry.com : accessed 18 Dec 2016); from FHL microfilm 1240357, from NARA microfilm T623, roll 357. 1910 U.S. Census, Jefferson, Adams, Indiana, ED 4, p.9B, dwelling/family 180, Frederick Berron; digital image by subscription, Ancestry.com (www.ancestry.com : accessed 18 Dec 2016); from FHL microfilm 1374351, from NARA microfilm T624, roll 338. Indiana, Death Certificates, 1899-2011, database on-line, Ancestry.com (www.ancestry.com : accessed 18 Dec 2016), Louisa Berron, 5 May 1911; Indiana State Board of Health, Indiana Archives and Records Administration, Indianapolis, Indiana. Indiana, Death Certificates, 1899-2011, database on-line, Ancestry.com (www.ancestry.com : accessed 11 Dec 2016), Fred Berron, 2 Sep 1915; Indiana State Board of Health, Indiana Archives and Records Administration, Indianapolis, Indiana. Thanks for compiling this information. Frieda was my great-grandmother and it’s interesting that I didn’t know all of this. You are very welcome. So happy to hear you found the information interesting and useful. Thanks for writing! My dad was Norman Kreischer Jr. which along with his Sister Gerturade Hoverman (Kreischer) are the children of Freida Kreischer. My name is Kelly Kreischer I am the son of Norman Kreischer Jr. I have three sister Sharon Marcia , Karen , I really enjoy this information you have shared . Thank you so much. It is good to hear you find the information useful and interesting. Thanks for writing!